Cooking on a barbecue using charcoal is easy and uncomplicated with our neat Outwell Charcoal Grills. The easy-to-transport Calvados Grill is joined by the new larger 16” Calvados L with full standing height. The Cazal Fire Pit and larger Cazal Fire Pit transform campsite evenings with cosy campfires as night falls. Our Locking Tongs and 3-in-1 Grill Cleaner are barbecue essentials for practical cooking and hygiene. 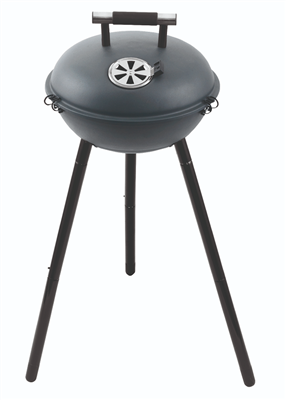 Get that fresh, smoky, flavour anywhere with this brilliant, portable Calvados charcoal BBQ. This large size has longer legs making it suitable to use next to a kitchen table. The lid reflects heat around the grill, so meat can cook from all sides, which is great for larger cuts and whole chickens. Use the air vents to help control the temperature. When you’re on the move, simple store the legs inside the grill, clip the lid on top, grab the handle and go. There are exciting developments in the wide collection of Outwell cooking options offering reliable performance and convenience. With a variety of fuel options to suit cooking styles and opportunities on site, in the garden and at home, campers can indulge their culinary skills knowing they can rely on Outwell to deliver. Our new Kitchen Electrics Range includes Skillet, Griddle, Contact grill, BBQ-grill and Induction.All Outwell gas cookers – Gourmet, Chef and Appetizer - use readily available gas cartridges for convenience with a new EN417 Regulator to control gas pressure flow. The Charcoal Grills deliver that smoky flavour campers love.